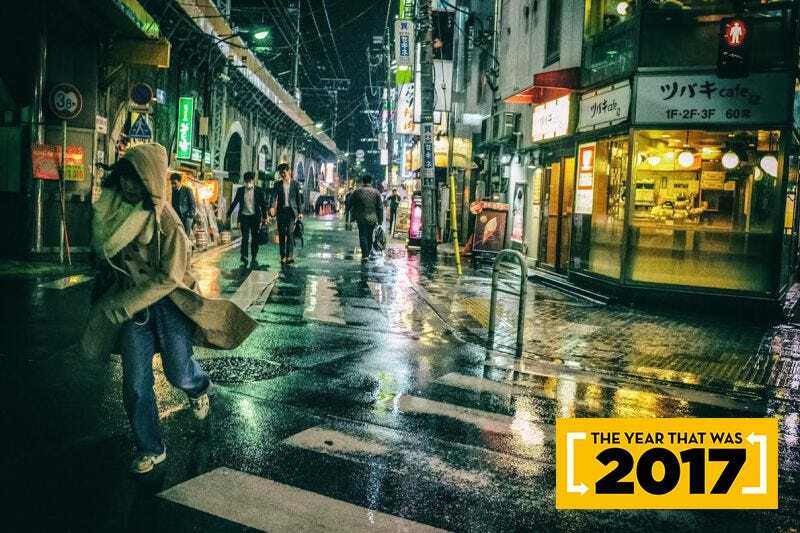 On a regular basis, Kotaku shows off reader-taken photos in a feature we call “JPGs.” Here are some, but certainly not all, of the best photos from this year. As you can see, the images show places that our readers might find interesting. How do you get featured on JPGs? Drop us a line, attaching a photo you’ve taken that is 800 pixels across and putting “JPGs” in the subject line. Do let us know where the photo was taken, and be sure to include your name as well as your website or Instagram if you want them linked. The Entrance at Kiyomizu-dera. Kyoto, Japan. By Eric Nguyen. Peace in the City. Kagoshima, Japan. By Luke Flynn. Windmills. Kinderdijk, Netherlands. By Todd Belcher. Snow On Mount Fuji. Japan. By Robert Rubsam. Sakura. Nakameguro, Tokyo, Japan. By Aaron Baggett. Ainokura Village. Toyama Prefecture, Japan. By Santiago Torres. Joven y Viejo. Havana, Cuba. By Matthew Kirdahy. Godafoss Waterfall. Bárðardalur, Iceland. By Russell Eck. Ryogoku Kokugikan. Tokyo, Japan. By Kyle Ellis. Rocky. Cappadocia, Turkey. By Duncan Gidney. Flatiron. New York City, New York. By Vincenzo Spina. En Route. Kyoto, Japan. By Vincent Maggio. Holyrood Abbey. Edinburgh, Scotland. By Mateo Vargas. Qibao. Shanghai, China. By Mike Robinson. Castle Stalker. Loch Laich, Scotland, UK. By Jerad Raines. The Dock. Fårö in Gotland, Sweden. By David Olsson. The Ginza Line. Tokyo, Japan. By João Salgueiro. Gion District. Kyoto, Japan. By Anthony Di Virgilio. Night. Kyoto, Japan. By Elliot Mitchell. Snowy Jaywalking. New York, New York. Aquiles Torres. Sangenjaya at Night. Tokyo, Japan. By Matt Laycock. This Past Spring. Miyajima, Japan. By Piyush Bedi. To Infinity and Beyond. Chicago, Illinois. By warlockpie. Tang Paradise Park. Xi’an, China. By Ronald Delgado. Maruyama Park. Kyoto, Japan. By Manuel Sánchez. Gion. Kyoto, Japan. By Jun David. Mont Saint-Michel. Normandy, France. By Aaron Amano.